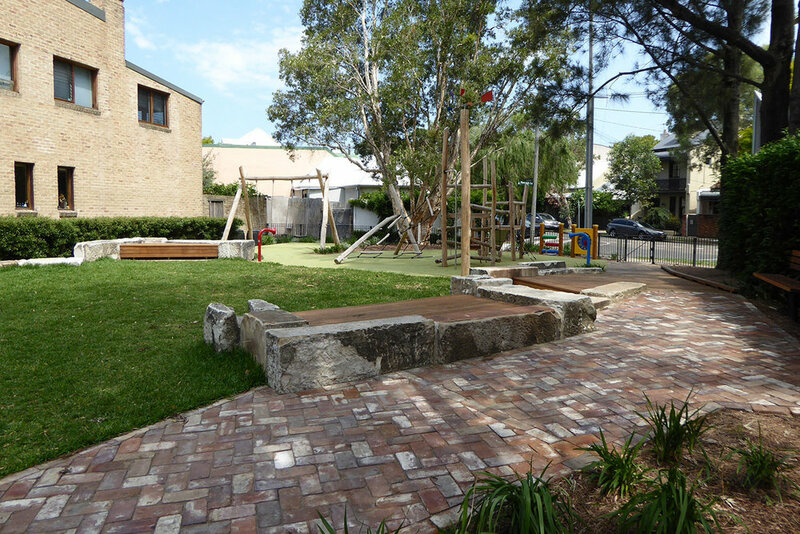 The Renwick Street Park upgrade project forms part of Stage 12 of the Small Parks Upgrade program carried out by the City of Sydney. Corkery Consulting was engaged by the City to prepare a concept design together with detailed design and documentation for the upgrade works. 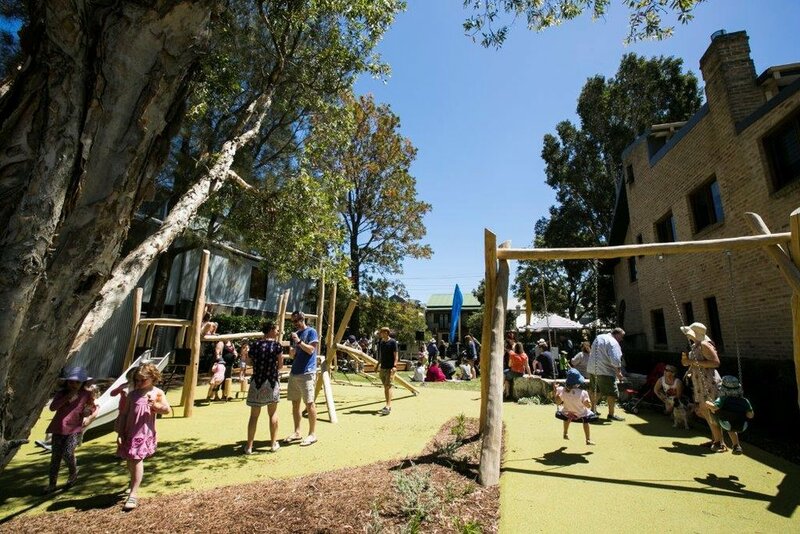 A comprehensive analysis was carried out that included a review of existing playgrounds and recreation opportunities within 400m of the Park to identify the play opportunities currently available and any gaps that could be filled by new facilities in Renwick Street Park. Design concept graphics were prepared by Corkery Consulting for presentations to the community by CoS. The new recreation facilities and opportunities incorporated in the Park are a response to initial community consultation carried out by the City. A Report on Environmental Factors for the proposed works was also prepared by Corkery Consulting and submitted to the City. The upgrade works included regrading, drainage, paving, boardwalk, seating decks, fencing, installation of playground equipment and creation of nature play opportunities. from Council’s depot were used to provide informal seating as well as a natural play opportunity for children. 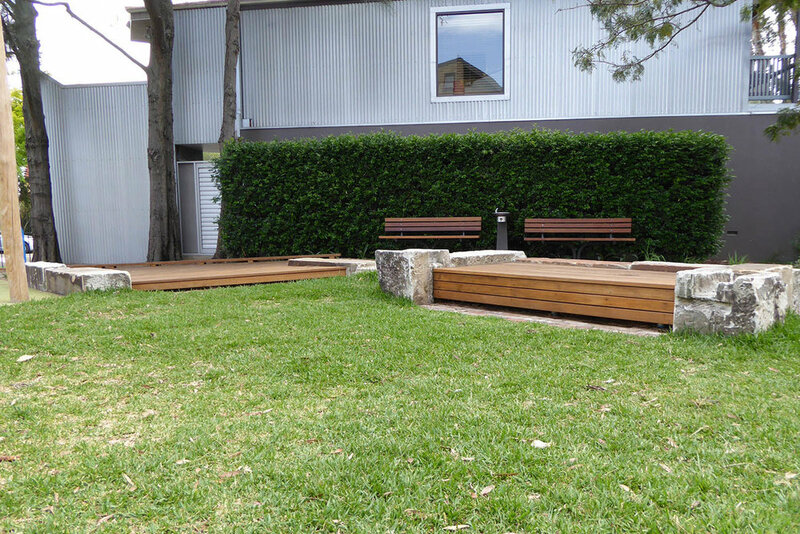 Timber decks are integrated with the sandstone blocks to provide seating and picnic opportunities. who provided specialist planning advice. AHMS were also engaged to prepare a Heritage Report that provided a detailed history of the site. New landscape plantings were designed by Corkery Consulting to compliment the retained trees and sections of hedge. Deciduous Crepe Myrtles were planted in the north east corner of the park to provide shade and colour during summer months and sun access during winter. Native species shrubs and ground cover were planted around the perimeter of the central turf play area.